Naturally, most of the memorials we record are to UK citizens, though we do also have some to the enemy (see blog of 27 February 2008). There are also many to our allies, including a number to the Polish wartime leader General Wladyslaw Sikorski. Throughout September and early October Imperial War Museum, London will be showing a special programme of rarely seen Polish features and documentaries, together with a selection of material from the museum’s film archive. The programme looks at the story of Eastern Europe from the outbreak of the Second World War, through the Stalinist years to the fall of the Iron Curtain and the eventual transition to democracy. A large number of Polish service personnel were stationed in the UK following the Nazi occupation of Poland and this has led to the erection of many memorials to the Polish war effort. A search of our database for Second World War with the keyword ‘Polish‘ turns up 69 memorials. They commemorate both the sacrifice made by the Polish and the assistance they received from local people. The memorial inscriptions are often in both English and Polish. A rather unusual memorial from Moffat, Dumfries and Galloway, commemorates one particular aspect of the assistance provided by local people. This plaque from Fladingworth, Lincolnshire sums up the sentiment expressed on many other memorials. During the Second World War, many refugees from the Nazi regime played an active role fighting again Germany both in defence of their allies and to help liberate their homelands. For the members of 3 Troop/ 10 (1A) Commando who were/ warmly welcomed in Aberdyfi/ while training for special duties in battle 1942-1943./ Twenty were killed in action. 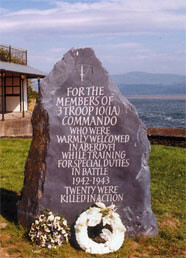 Additional plaques in both English and Welsh give more information about 3 Troop 10 Commando. It was made up initially of 86 German speaking refugees who were given fictitious names and identities as British Nationals. They were involved with various special duties including reconnaissance, interrogation and intelligence. Many made lasting friendships in the local community and two even married local women. During the Second World War several Polish-manned ships and submarines fought alongside the Royal Navy. Some of these vessels had escaped following the German invasion and others were loaned by the Royal Navy. The Polish sailors occupied barracks at Devonport, Plymouth and after the war some remained and made their home in the UK.